If you haven't visited before, I highly recommend whiling away an hour at the website of the Museum of Play. It's simply packed with all the toys and games that thrilled you as a child. They also have an extensive collection of games you've probably never heard of. Many of these rather obscure games still have a few copies circulating that can be bought through secondhand sites like eBay, etsy, and even Amazon. Here are six that we'd love to see find a second act. Games where players spin, roll, or draw random numbers to advance their pieces on a game board are called "race games," and this 1790 gem was one of the earliest. The object was to live a moral life, progressing 84 years and becoming The Immortal Man. But there were sinful pitfalls along the way. The Negligent Boy lost his turn for two rounds. Land on The Drunkard and be sent all the way back to two years of age. The rules are actually written in and around the game board, and are quite complicated by modern standards. The game itself was made of paper adhered to foldable linen, and it cautioned that a numbered totem (spinning top) be used to avoid bringing dice into your home. In fact, the focus on right and wrong in this game was one of its selling points; that made it a tool of moral instruction, not a method of "gaming." Although The Game of Life still exists today (and has in some form for hundreds of years), none broach the beauty and moral intensity of this historical treasure. This 1982 game of despair gives its players permission to lean into the pain. Which, considering the rate at which Boomer marriages were declining in the 1980s, could be quite cathartic. You can play this game two ways: Try to traverse the maze-like playing board and finish with the least amount of stress, divorce, and financial woes among the players, or declare yourself a midlife crisis and plunge headlong in the other direction, destroying your life in a brilliant blaze of terrible choices, bad luck, and idiotic indulgences. The charm of the game is the dark humor on the card spaces, called ZAP! and Crisis, much like Monopoly's Community Chest and Chance cards. Instead of winning $10 in a beauty contest, however, you find your daughter has eloped with a drifter poet, or that your spouse is irritated you don't have a sense of humor about her affair. It's black humor and dark fun at its finest, sure to connect with many a struggling mid-lifer. 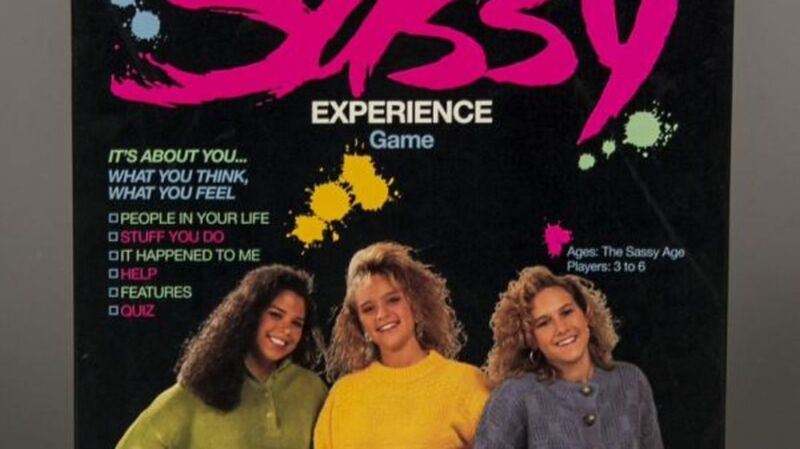 Sassy was a teen girls magazine that folded in 1994, never quite able to summon the advertising strength of other teen mags. Maybe that's because it was different. Sassy assumed that the girls reading it were smart and worldly; articles about alternative music trends and edgy fashion were set among pieces about alcoholic parents and dealing with STDs. Sassy, according to Kara Jesella and Marisa Meltzer, the authors of How Sassy Changed My Life, had a smart, strong feminist message, giving them more than advice on how to land the boy of your dreams or how to starve yourself until you are loveable. How that great magazine translated to this hard-to-find boardgame (in which there is no board) is a little more complicated. The rules are hard to discern (though the drunken, foul-mouthed team from Beer and Board Games make an effort at it), but the goal seems to have been to be the first player to collect awards in the categories of Awareness, Brains, Confidence, Love, Sensitivity, and Talent. The other players vote on whether or not each girl's answer to questions on those topics is deserving of a Sassy or Non-Sassy point. There is no telling the amount of women, many who've grown from Sassy girls to women with the brains, power, and ferocity to shape culture and society, would delight in the re-issue of this game. Crissy was a popular doll issued in the late '60s by the Ideal Toy Company, and beloved for her hair, which could be extended to any length her owner desired. Unlike Barbie, Crissy was a true "dolly" size (18 inches), and had the less-voluptuous body dimensions of a true adolescent, which appealed to conservative pre-Boomer mothers and their pocketbooks. In this game, Velvet (Crissy's younger, shorter cousin) and Crissy hit the shops to use the money they've earned ("Good Report Card! $5!") to wisely purchase their greatest desires ("Mod shoes! $10! Bell-Bottoms! $10!"). It's not exactly enlightening—but it's fun. If you're a Ken Burns junkie you might already be familiar with the curiously catchy tune "Say Hey (The Willie Mays Song)" by the Treniers, featured in the documentary soundtrack to Baseball. There are conflicting theories as to how Hall of Famer Willie Mays became the "Say Hey" kid, but it probably had to do with his use of slang that would become common decades down the line. (Mays had a tendency to respond with "Say what? Say who?" and when meeting someone whose name he couldn't remember, "Say Hey, guy!") At any rate, the name stuck, and Mays entered the boardgame market in 1954. The rules were probably too involved for a non-baseball fan to understand, involving three spinners to represent the pitcher, batter, and fielder, respectively. But since people still love baseball, Mays, and spinners, only good things could come from reintroducing this game. This 19th-century game is a sort of "gin rummy," but with stately bird illustrations replacing sinful playing cards. Children would learn to match the 64 cards of eight birds groups (wading birds, pigeon tribe, honey eaters, web-footed, birds of prey, running birds, and singing birds). I, for one, would like to see if beautiful illustrations and focused trivia might sit well with modern kids. Maybe we've been underestimating them.